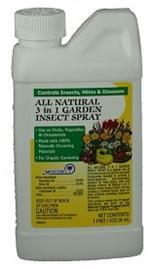 Garden Insect Spray is intended for control of worms (caterpillars) and other listed insects. Garden Insect Spray does not significantly impact predatory beneficial insects, predatory mites, and spiders while controlling target pests. Susceptible insect pests may be observed on plants up to several hours after treatment, but will have ceased active feeding before being killed. Garden Insect Spray is classified as an organic substance by the USDA National Organic Standards Board. 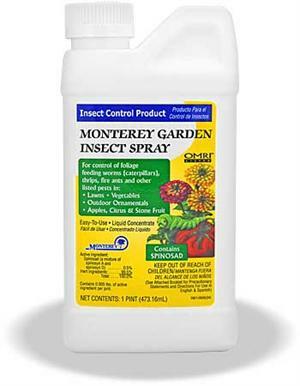 Monterey Garden Insect Spray is for residential use in home gardens, lawns and ornamentals. Not for use on plants being grown for sale or other commercial use, or for commercial seed production, or for research purposes. Would you like to see the Garden Insect Spray Label? How about the Garden Insect Spray MSDS sheet?